Download "Multi-layer MPLS Network Design: the Impact of Statistical Multiplexing"
1 Multi-layer MPLS Network Design: the Impact of Statistical Multiplexing Pietro Belotti, Antonio Capone, Giuliana Carello, Federico Malucelli Tepper School of Business, Carnegie Mellon University, Pittsburgh PA Dipartimento di Elettronica e Informazione, Politecnico di Milano, Italy Abstract The possibility of adding MPLS support to transport networks is considered an important opportunity by telecom carriers that want to add packet services and applications to their networks. However, the question arises whether it is suitable to have MPLS nodes just at the edge of the network to collect packet traffic from users, or to introduce also MPLS facilities on a subset of the core nodes in order to exploit packet switching flexibility and multiplexing, thus inducing a better bandwidth allocation. 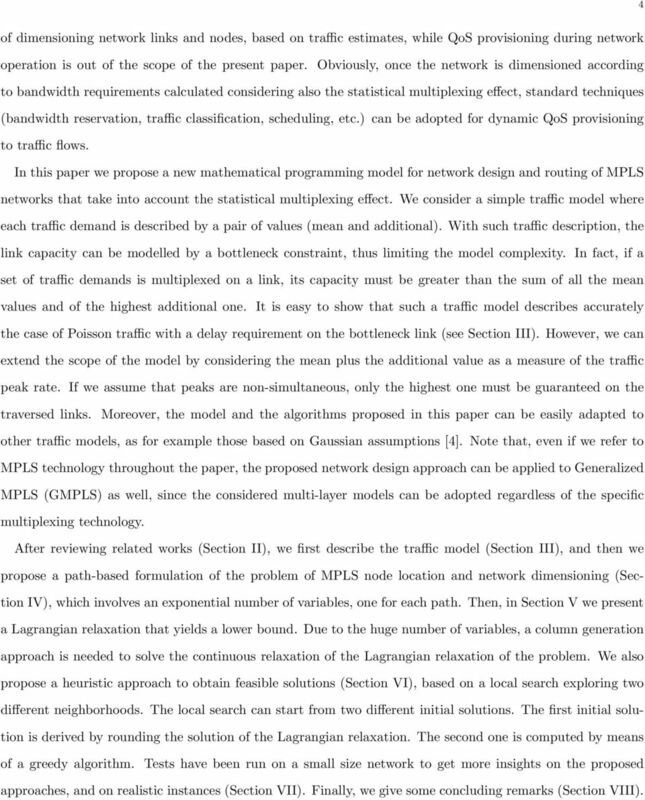 In this paper we propose a mathematical programming model for the design of two-layer networks where MPLS is considered on top of transport networks (SDH or WDM depending on required link speed). Our models take into account the tradeoff between the cost of adding MPLS support in the core nodes and the savings in the link bandwidth allocation due to the statistical multiplexing and the traffic grooming effects induced by MPLS nodes. The traffic matrix specifies for each point-to-point request a pair of values: a mean traffic value and an additional one. Using this traffic model, the effect of statistical multiplexing on a link allows to allocate a capacity equal to the sum of all the mean values of the traffic demands routed on the link and only the highest additional one. 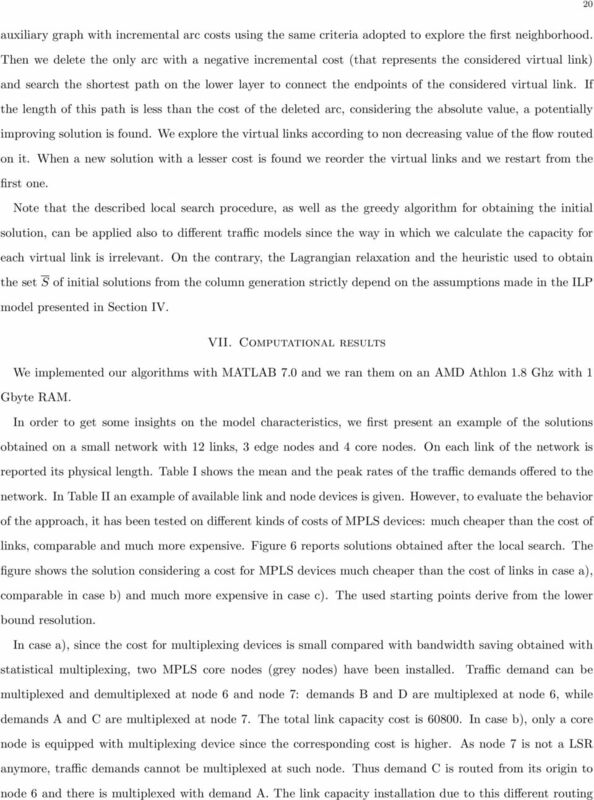 We propose a path-based Mixed Integer Programming (MIP) model for the problem of optimizing the number and location of MPLS nodes in the network and the link capacities. We apply Lagrangian relaxation to this model and use the subgradient method to obtain a lower bound of the network cost. As the number of path variables used to model the routing grows exponentially with the graph size, we use an initially limited number of variables and a column generation approach. We also introduce a heuristic approach to get a good feasible solution. Computational results are reported for small size and real-world instances. Keywords Multi-layer Network Design, MPLS, Statistical Multiplexing, Traffic Grooming, Optimization Models, Heuristics, Lagrangian Relaxation. Submitted to Computer Networks, May 15, This work has been partially supported by Alcatel-Lucent and by the European Network of Excellence EURO-NGI. 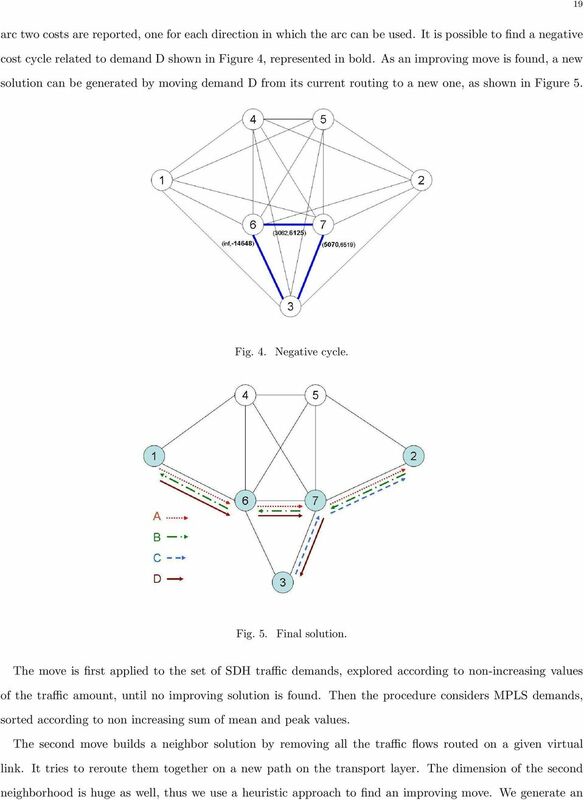 4 4 of dimensioning network links and nodes, based on traffic estimates, while QoS provisioning during network operation is out of the scope of the present paper. Obviously, once the network is dimensioned according to bandwidth requirements calculated considering also the statistical multiplexing effect, standard techniques (bandwidth reservation, traffic classification, scheduling, etc.) can be adopted for dynamic QoS provisioning to traffic flows. 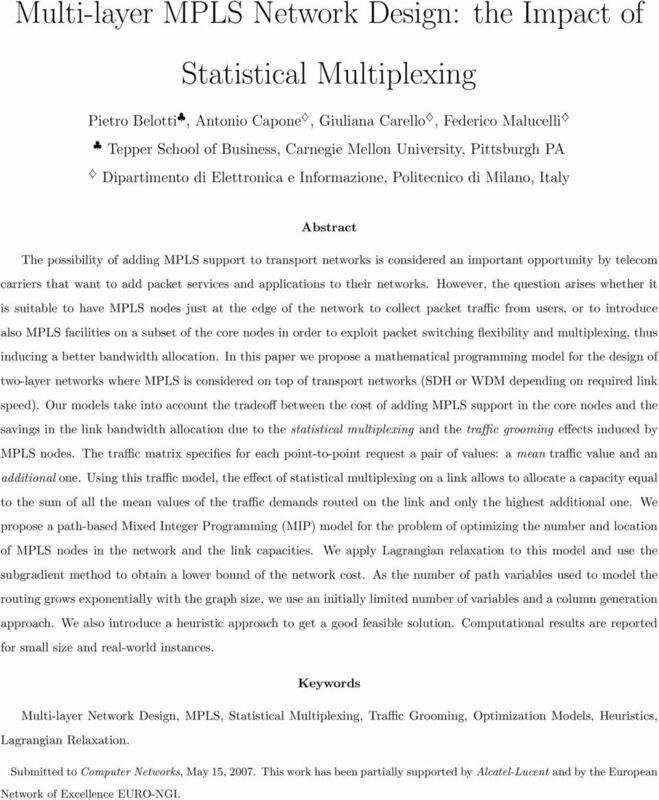 In this paper we propose a new mathematical programming model for network design and routing of MPLS networks that take into account the statistical multiplexing effect. We consider a simple traffic model where each traffic demand is described by a pair of values (mean and additional). 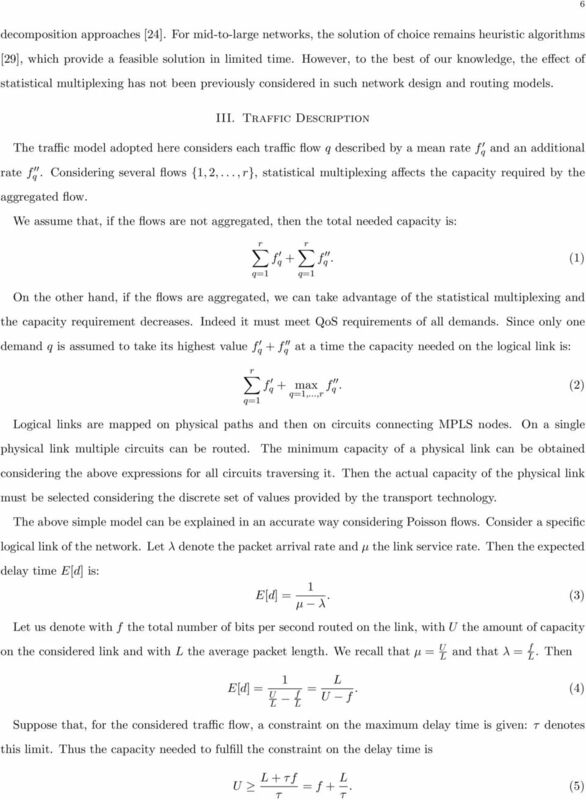 With such traffic description, the link capacity can be modelled by a bottleneck constraint, thus limiting the model complexity. In fact, if a set of traffic demands is multiplexed on a link, its capacity must be greater than the sum of all the mean values and of the highest additional one. It is easy to show that such a traffic model describes accurately the case of Poisson traffic with a delay requirement on the bottleneck link (see Section III). However, we can extend the scope of the model by considering the mean plus the additional value as a measure of the traffic peak rate. If we assume that peaks are non-simultaneous, only the highest one must be guaranteed on the traversed links. Moreover, the model and the algorithms proposed in this paper can be easily adapted to other traffic models, as for example those based on Gaussian assumptions . 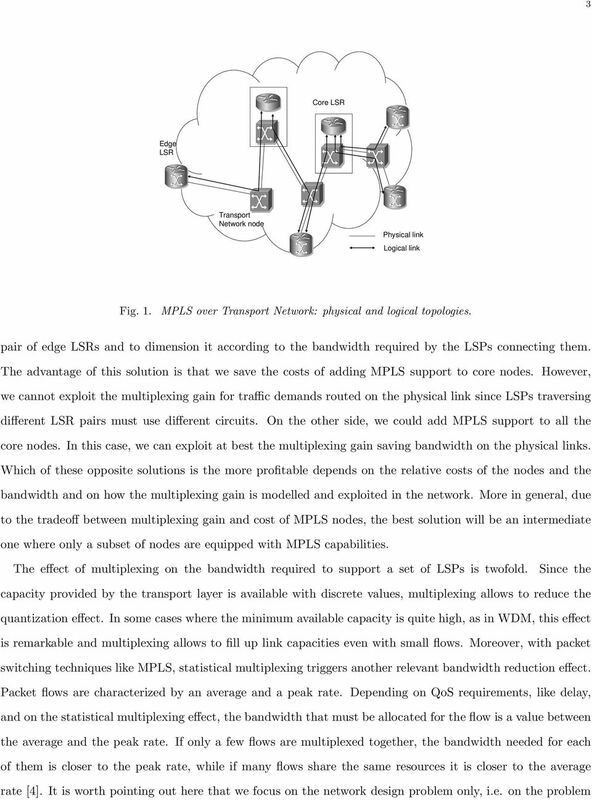 Note that, even if we refer to MPLS technology throughout the paper, the proposed network design approach can be applied to Generalized MPLS (GMPLS) as well, since the considered multi-layer models can be adopted regardless of the specific multiplexing technology. 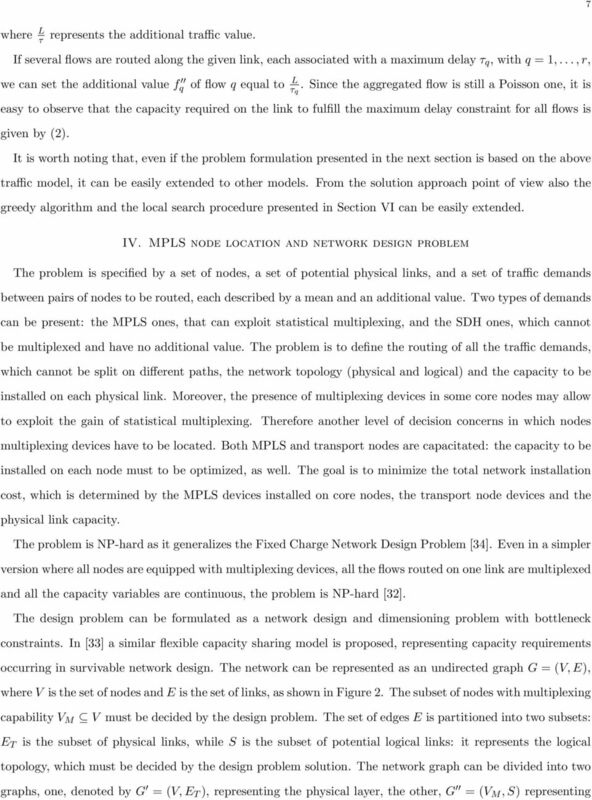 After reviewing related works (Section II), we first describe the traffic model (Section III), and then we propose a path-based formulation of the problem of MPLS node location and network dimensioning (Section IV), which involves an exponential number of variables, one for each path. Then, in Section V we present a Lagrangian relaxation that yields a lower bound. 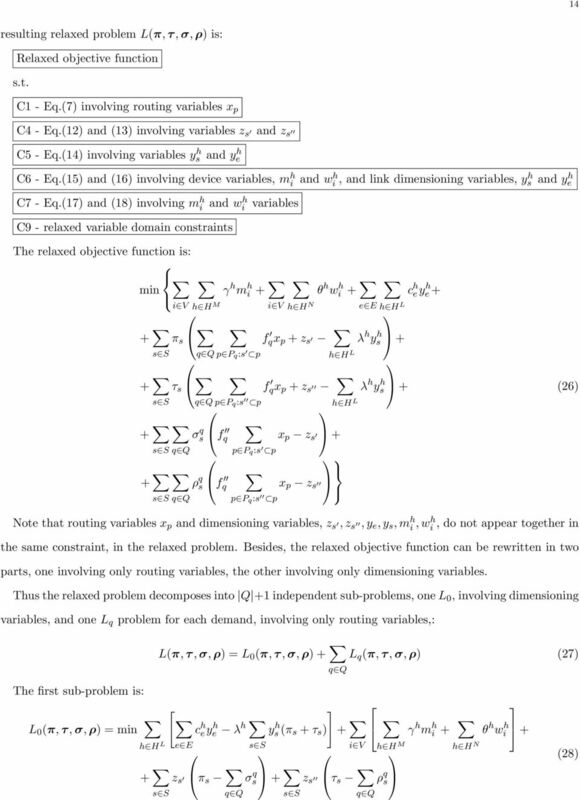 Due to the huge number of variables, a column generation approach is needed to solve the continuous relaxation of the Lagrangian relaxation of the problem. We also propose a heuristic approach to obtain feasible solutions (Section VI), based on a local search exploring two different neighborhoods. The local search can start from two different initial solutions. The first initial solution is derived by rounding the solution of the Lagrangian relaxation. The second one is computed by means of a greedy algorithm. Tests have been run on a small size network to get more insights on the proposed approaches, and on realistic instances (Section VII). Finally, we give some concluding remarks (Section VIII). 9 9 source and destination nodes, s q and t q, of the traffic demand through two arcs with null cost. Thus traffic demand q must be routed on the two auxiliary links (s q, s q ) and (t q, t q). Then we route this demand q on an LSP composed only by one single virtual link (the shortest path on the SDH topology between these two auxiliary nodes). This way, every SDH demand is not multiplexed with the other demands. A complete mathematical representation of the devices that can be installed on each node would be very complicated and worthless. However, we need to model the cost scheme and the relationship between cost, capacity and traffic flow. Thus we have chosen a general multi-facility model by defining a set of available devices that can be installed on each transport node, corresponding to discrete capacity values. A different cost is associated with each device. Let H N be the set of device types that can be installed on each transport node. For each h H N let µ h and θ h be the capacity (in Mbit/s) and the cost of a device of type h. We adopted the same approach to model the upper level (MPLS) node scheme. The set of available MPLS node device types is denoted with H M. For each h H M, ψ h and γ h denote the capacity (in Mbit/s) and the cost of device of type h 1. Finally, H L denote the set of available transport channels, that can be installed to a transport link e E T. For each e E T and h H L, c h e is the cost of installing one channel of type h on e, and λ h is its capacity. This cost depends not only on the type of channel installed but also on the length of the considered physical link. An unavoidable quantization effect is present due to the granularity of the installed capacity, as the capacity on nodes and arcs is provided by selecting node device and link channel types. Costs associated with available device and circuit types increase less than linearly with respect to the capacity. An example of capacities and costs of node and link devices will be presented in Section VII. 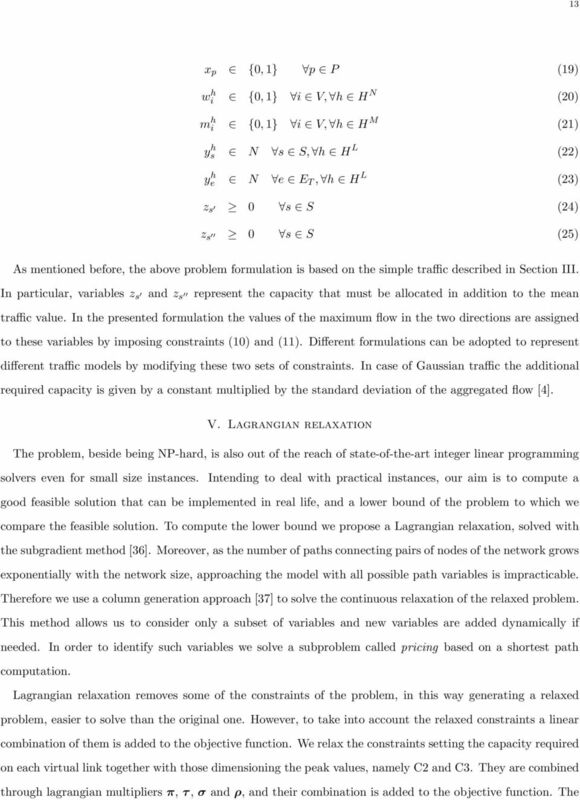 We present a path based formulation where P denotes the set of all the paths between pairs of nodes of V. Given a traffic demand q, P q denotes the set of paths connecting s q and t q. Each path is a LSP set up by a sequence of virtual links. We have chosen to model routing paths with path variables instead of flow variables. Path formulations have a potentially very large number of variables (exponential in V ) but are more flexible in that, in general, only a subset of these variables is needed. 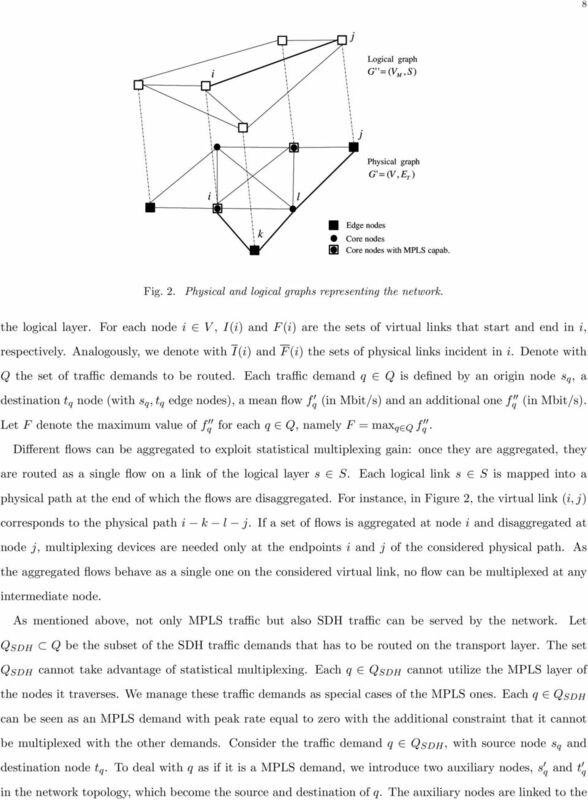 We define a binary variable x p for each path p P connecting node s q to t q such that: 1 if traffic demand q is routed on path p, x p = 0 otherwise. 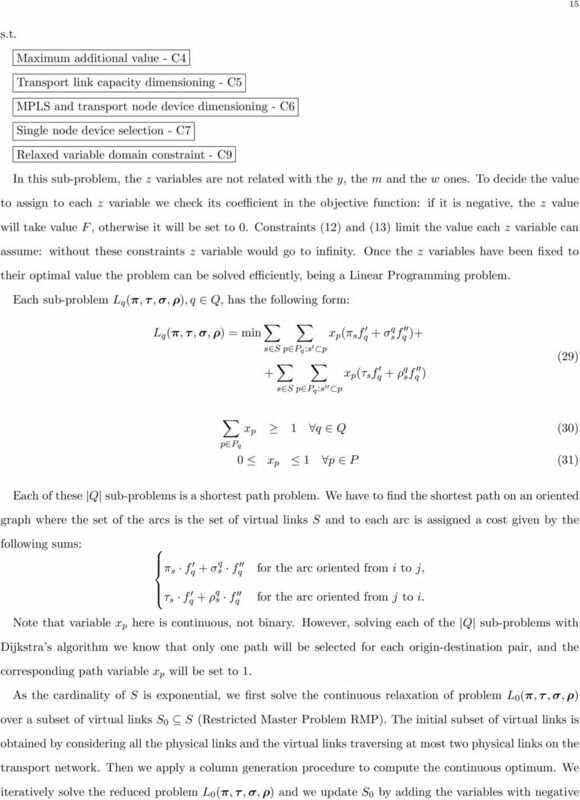 These variables are subject to routing constraints guaranteeing that each demand is served by one path. Besides, they are involved in capacity setting constraints, together with variables representing the capacity 1 We assume that at most one device can be installed on each node of both layers. The different devices represent the different capacities which can be provided on a node. Their cost can include, when necessary, also the platform cost. 11 11 Transport link capacity dimensioning - C5 MPLS and transport node device dimensioning - C6 Single node device selection - C7 Variables domain - C8 The objective function asks to minimize the total network costs (eq. (6)), i.e., the capacity installation cost, given by the sum of three components: MPLS node device costs, transport node device costs and transport link capacity costs. 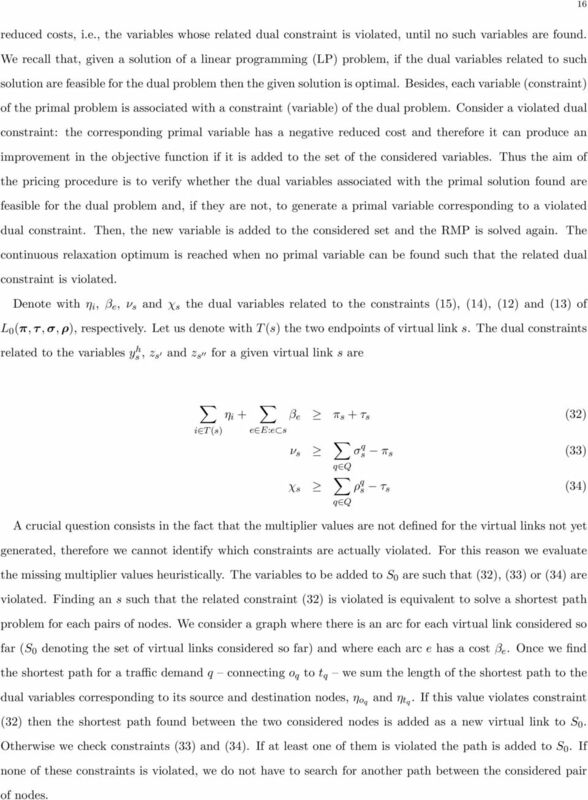 min γ h m h i + θ h wi h + i V h H M i V h H N e E T c h e ye h (6) h H L Routing constraint: routing constraints (eq. (7)) impose that each traffic demand is routed on at least one path. As x p are binary variables, the demands are not split among several paths 2. x p 1 q Q (7) p P q Virtual link required capacity setting: the constraints (eq. (8) and (9)) set the amount of capacity needed by each virtual link, which must provided through the transport channels installed on the lower layer. For each of the two directions, the required capacity must fulfill the sum of the mean values of the demands routed on it and of the maximum of the additional rates (given by z s variable). f qx p + z s q Q p P q:s p q Q p P q:s p λ h ys h s S (8) h H L f qx p + z s λ h ys h s S (9) h H L Virtual link highest additional value computing: the maximum value of the peak rates on each virtual link is stated by bottleneck constraints (eq. (10) and (11)): it must be greater or equal to the additional value of each demand routed on the considered link. f q f q p P q :s p p P q:s p x p x p z s q Q, s S (10) z s q Q, s S (11) 2 The problem requires a path for each demand, while in the constraint at least one path for each demand is required. However, in the following constraints all the amount of traffic is assumed to be routed on a path p such that x p = 1. Therefore, assigning value one to more that one path variable would increase the amount of needed capacity and thus the costs. 12 12 Maximum additional value: redundant constraints (eq. (12) and (13)), setting the maximum value of the additional traffic on any link, are added to bound the value of z s and z s : they are useful in solving the relaxation proposed in the next section. z s F s S (12) z s F s S (13) Transport link capacity dimensioning: constraints on the transport link capacity (eq. (14)) guarantee that physical links have sufficient installed capacity to support the traffic of virtual links routed on them. 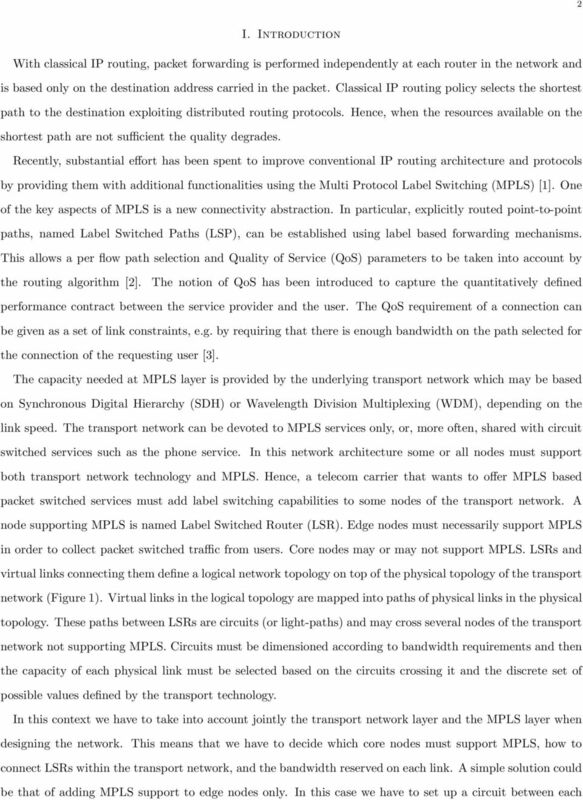 λ h ys h h H L s S:e s h H L λ h y h e e E T (14) MPLS and transport node dimensioning: node-dimensioning constraints (eq. (15) and eq. (16)) impose that the amount of capacity of each layer of a node, provided by the choice of the device to be installed, is not exceeded by the amount of traffic routed through the node. On the other hand, these constraints force the choice of the suitable node devices to be installed on each node layer to deal with the overall traffic rate of the incoming links. h H L λ h h H L λ h s I(i) F (i) e I(i) F (i) y h s y h e h H M ψ h m h i i V (15) h H N µ h w h i i V (16) Single node device selection: constraints (17) and (18) impose to install at most one type of device on each layer of a node. h H M m h i 1 i V (17) h H N w h i 1 i V (18) Variables domain: last constraints (eq. (19) - (25)) impose variable domains: they are integrality and nonnegativity constraints. 16 16 reduced costs, i.e., the variables whose related dual constraint is violated, until no such variables are found. We recall that, given a solution of a linear programming (LP) problem, if the dual variables related to such solution are feasible for the dual problem then the given solution is optimal. Besides, each variable (constraint) of the primal problem is associated with a constraint (variable) of the dual problem. Consider a violated dual constraint: the corresponding primal variable has a negative reduced cost and therefore it can produce an improvement in the objective function if it is added to the set of the considered variables. Thus the aim of the pricing procedure is to verify whether the dual variables associated with the primal solution found are feasible for the dual problem and, if they are not, to generate a primal variable corresponding to a violated dual constraint. Then, the new variable is added to the considered set and the RMP is solved again. The continuous relaxation optimum is reached when no primal variable can be found such that the related dual constraint is violated. Denote with η i, β e, ν s and χ s the dual variables related to the constraints (15), (14), (12) and (13) of L 0 (π, τ, σ, ρ), respectively. Let us denote with T (s) the two endpoints of virtual link s. The dual constraints related to the variables ys h, z s and z s for a given virtual link s are η i + β e π s + τ s (32) i T (s) e E:e s ν s q Q σ q s π s (33) χ s q Q ρ q s τ s (34) A crucial question consists in the fact that the multiplier values are not defined for the virtual links not yet generated, therefore we cannot identify which constraints are actually violated. For this reason we evaluate the missing multiplier values heuristically. The variables to be added to S 0 are such that (32), (33) or (34) are violated. Finding an s such that the related constraint (32) is violated is equivalent to solve a shortest path problem for each pairs of nodes. We consider a graph where there is an arc for each virtual link considered so far (S 0 denoting the set of virtual links considered so far) and where each arc e has a cost β e. Once we find the shortest path for a traffic demand q connecting o q to t q we sum the length of the shortest path to the dual variables corresponding to its source and destination nodes, η oq and η tq. If this value violates constraint (32) then the shortest path found between the two considered nodes is added as a new virtual link to S 0. Otherwise we check constraints (33) and (34). If at least one of them is violated the path is added to S 0. If none of these constraints is violated, we do not have to search for another path between the considered pair of nodes. 21 21 a) b) c) Fig. 6. 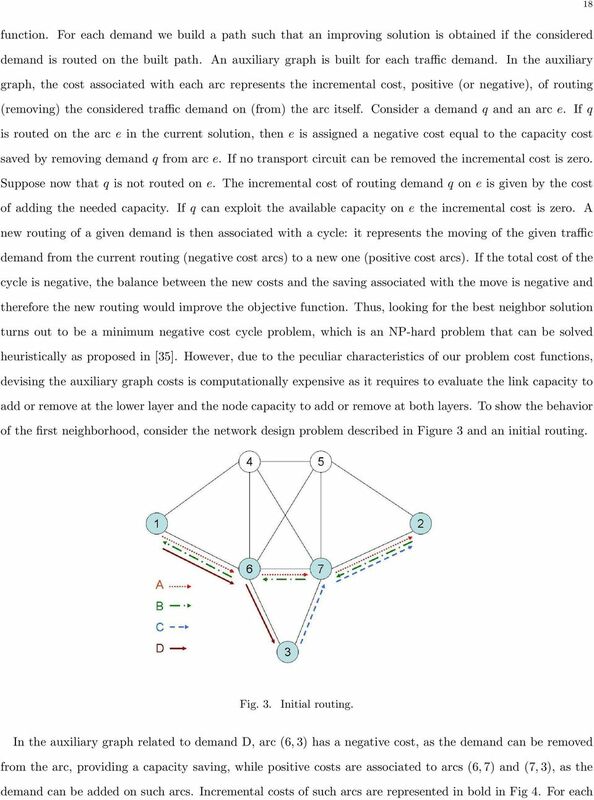 Example: effect of MPLS node costs on design and routing. Min-cost flow problems and network simplex algorithm The particular structure of some LP problems can be sometimes used for the design of solution techniques more efficient than the simplex algorithm. The multi-integer set cover and the facility teral cover problem Dorit S. Hochbaum Asaf Levin December 5, 2007 Abstract The facility teral cover problem is a generalization of the vertex cover problem. Large-scale hierarchical networks: How to compute an optimal architecture? Konrad-Zuse-Zentrum für Informationstechnik Berlin Takustraße 7 D-14195 Berlin-Dahlem Germany ANDREAS BLEY THORSTEN KOCH ROLAND WESSÄLY Large-scale hierarchical networks: How to compute an optimal architecture? Discuss the size of the instance for the minimum spanning tree problem. The Essence of the Simplex Method Recall the Wyndor problem Max Z = 3x 1 + 5x 2 S.T. x 1 4 2x 2 12 3x 1 + 2x 2 18 x 1, x 2 0 Chap 4 The Simplex Method 8 corner point solutions. 5 out of them are CPF solutions.